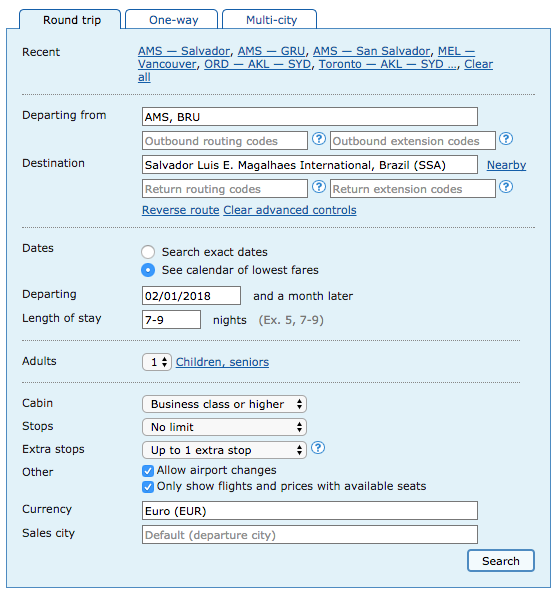 Today it’s the return of my planning series of posts as a bit of a primer on how to search for great fares. 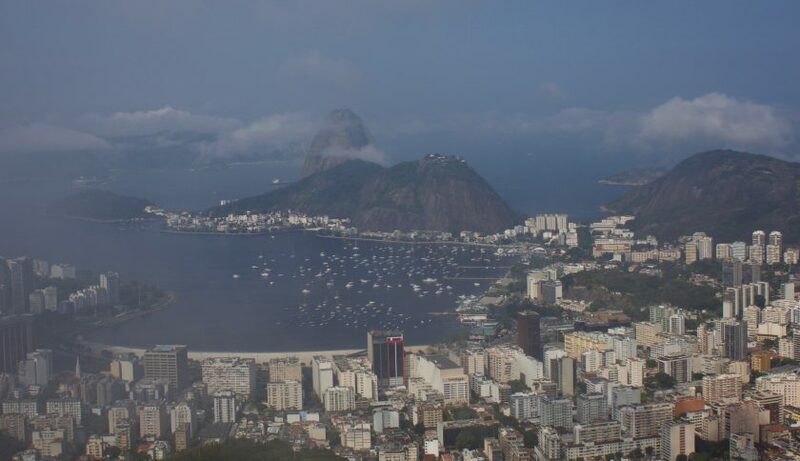 A good friend is looking to get to Salvador in Brazil early next year from his home in Holland. As normal, I started off with ITA Matrix as my go to tool, putting in the following search criteria. 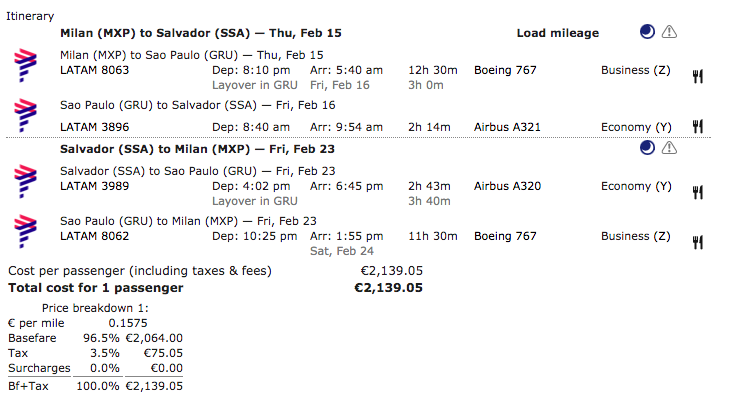 To Salvador, Brazil (which is SSA and not SAL)! Amsterdam would be the most convenient location, however in Europe it’s pretty easy to get low cost flights to position yourself to start somewhere else. Brussels typically can have some very good fares, as well as Copenhagen and Dublin too. Barcelona is an emerging low-cost airline base, particularly to the Americas as both Level and Norwegian have a base there now. Milan is also good as Alitalia have retrenched to Rome and there is a big fight over the Italian market given their bankruptcy proceedings. I could have added in a few Nordic destinations such as Stockholm and Oslo, but this is probably enough for the moment. In terms of the stay length, it’s important to ensure that one has a Saturday night stay to get the lowest fares. So ensuring that one looks at a stay of 7 to 9 nights means the engine should pick up the flights with the cheapest business class availability either side of that. Once you’ve got an idea of when and where the best fares are, you can start to narrow things down. Plugging all of that data in and we’re given the following as the lowest price flights. I’m sure we can do better than that, so I’m going to change the search to look at flights to Rio or Sao Paulo to see if that makes a bit of a difference as they are more popular destinations to fly to. This is quite convenient as it actually starts and ends in Amsterdam, however does require getting a flight from Sao Paulo to Salvador. This should add on another €150 or so to the price, which is still leaving us at a total cost of around €2,000, which is higher than I think my friend should pay. I did tweak the parameters of my search to include Stockholm and Oslo, and there was a cheaper fare – coming in at €1715 return. However the costs of positioning from Amsterdam to Oslo would likely equal the saving so would say that it wouldn’t be worth the time or money spent getting there. I next decided to have a look at just departures from Amsterdam (and Brussels) to Salvador only, but with any alliance carrier. My search looks like this. It would be flying Alitalia. I’ve written a number of articles about the current issues that Air Berlin are going through within their bankruptcy process. Alitalia were also funded by Etihad and are also in the process of being bailed out, again, by the Italian government, potentially contravening EU state-aid rules. Given this uncertainty, there is no way I would book a fare on either carrier at present as come February, there is a high likelihood that they won’t be around any more. 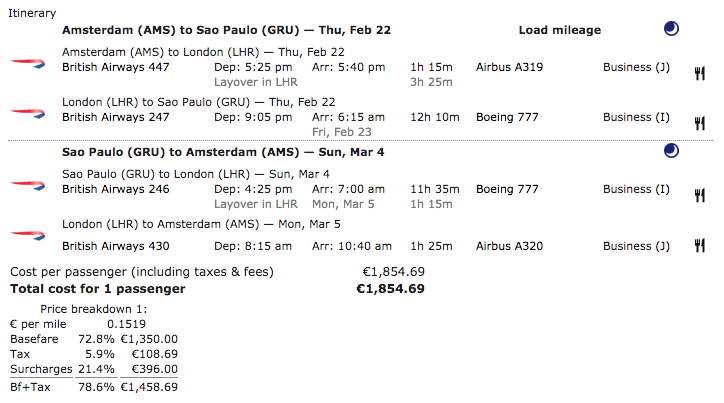 The final tweak I made to the search parameters was to look at flights from Amsterdam and Brussels to Rio and Sao Paulo only. 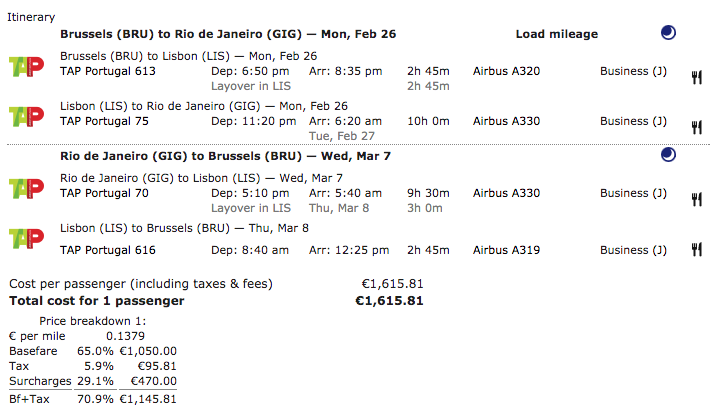 This did turn up a reasonable fare, with Air Portugal for €1615, albeit starting in Brussels a train journey away. Also, it’s a J fare, so earns 2 x the miles with Lufthansa’s Miles and More programme, with the Brussels to Lisbon earning a fixed 2,000 miles, for a total of over 23,000 miles. Overall, I’d still wait a bit as I think fares will go lower, however it depends on one’s appetite for risk. 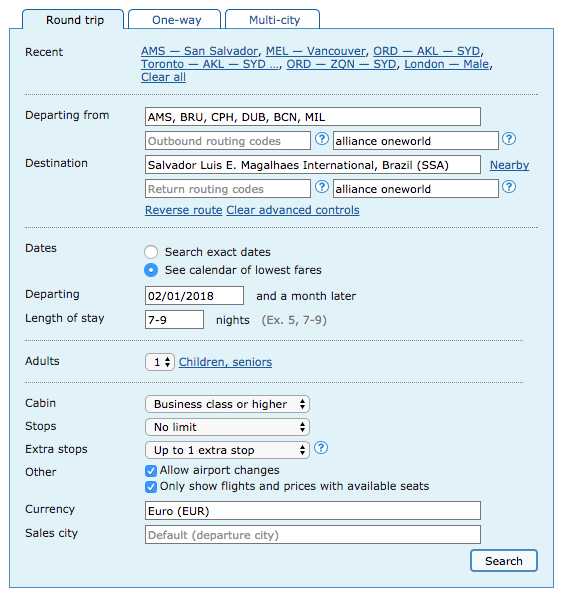 If you like to plan and get things locked in ahead of time, then the British Airways fare can provide good value. Also, as an elite member, booking via a travel agent, it can be easily upgraded to First Class using a Gold Upgrade voucher. The TAP fare is also good value for Star Alliance, however their product I have heard can be a little ropey. Previous Post: British Airways £30 sale. Next Post: Fare Deal. Prague to the US and Canada. All alliances.